Since inception, we are engaged in manufacturing, trading, supplying and exporting a wide range of Industrial Spare Parts. Designed in accordance with international quality standards and norms, our range is dimensionally accurate. We manufacture these spare parts using quality raw material. These spare parts are anti-corrosive in nature. In this range, we offer Piston And Piston Pins, Connecting Rod/Piston Rod and Piston Rings And Rider Rings, among others. We are known in the industry for our proficiency and expertise in manufacturing Piston and Piston Pins. 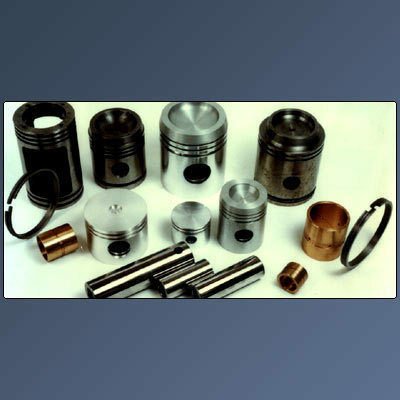 Clients can avail these pistons and piston rods from us in varied material, sizes and technical specifications. At various stages of production, these industrial spare parts are duly checked to ascertain defect-free nature of our entire range. Our organization is instrumental in offering Valve Disc and Springs to the clients in varied technical specifications. Owing to precise dimensions, resistance to corrosion & abrasion and longer functional life, our valve discs and springs receive huge demand in the market. Clients can avail quality-approved Piston Rings and Rider Rings from us at industry leading prices and in varied technical specifications. Norms and standards set by the industry are strictly followed while manufacturing these spare parts. Prior to dispatching these spare parts to clients' end, our quality controllers conduct stringent checks on these. Backed by an advanced infrastructure facility and diligent team, we are able to bring forth for our clients Liners and Cylinders at par with international quality standards. We manufacture these engineering components in varied sizes and technical specifications, in accordance with the variegated demands of clients. These liners have high tensile strength. We are also engaged in offering best quality Industrial Gaskets to our clients that are reckoned for their tensile strength and elongation. Manufactured in accordance with customers' demands and requirements, our qualitative gaskets have helped us become their preferred choice. We make these industrial gaskets available in varied sizes and technical specifications. Customers located across the globe can avail from us an optimum quality range of Screw Compressor Component Kit at market leading prices. These component kits are manufactured at our advanced facility using latest machinery and quality approved metals & alloys. Utilized in various industries, these screw compressor component kits have helped us cater to the variegated needs of clients. We bring forth for our clients a wide range of Valve Plate Assemblies, which is manufactured and supplied in varied thickness and other specifications, as per the requirement. International quality standards are strictly followed while manufacturing these valve plate assemblies. Customized valve plate assemblies are also offered by us. Our optimum quality range of Oil Separators has helped us become the preferred choice of patrons and garner a rich clientele in the market. These oil separators are manufactured in standard as well as customized specifications to cater to the demands of clients in the most efficient manner. With the aid of our logistic division, we timely deliver these oil separators at clients' end. Since inception, we are engaged in manufacturing, supplying and exporting a premium quality range of Bearing Half Section & Main Bearing, which is timely delivered at clients' preferred destination. We have the technical knowledge and expertise to design & develop these spare parts in exact compliance with clients' demands. Crank Shafts offered by us are manufactured using certified material sourced from reputed vendors of the market. Reckoned for optimum quality standards, our crank shafts receive huge demand in the automotive and allied engineering fields. Quality metal and alloys are used in the fabrication process of these spare parts. We are known in the industry for our proficiency and expertise in manufacturing optimum quality Filter Elements. In this product range, we offer filter elements in plain & twilled square and plain & twilled dutch weave patterns. Manufactured using quality-approved material, our filter elements are corrosion & abrasion resistant in nature. Clients can avail from us a qualitative range of Valve Parts from us in varied specifications at industry leading prices. To cater efficiently to their demands, we offer these valve parts in standard as well as customized designs. Fabricated using tested metal and alloys, our spare parts are corrosion resistant and dimensionally accurate. Clients can avail from us a qualitative range of Valve Assemblies from us at market leading prices and within the promised time frame. The specific demands of our patrons are kept in mind while designing and developing our range of valve assemblies. We manufacture the entire range of valve assemblies in compliance with international standards, using tested material. We are one of the reputed providers of a quality range of Shaft Seals & Oil Seals, which is made available in varied sizes and specifications. These spare parts are precisely designed and developed with the aid of our engineers who have immense experience in this particular field. We are engaged in providing our esteemed clients with an approved range of Connecting Rods. These connecting rods are fabricated using tested steel, aluminum, alloys and other material. We make use of advanced technology and methodology while manufacturing these connecting rods. Our qualitative product is widely demanded in the automotive industry. Backed by a diligent team of professionals, we are able to cater to the exact demands of clients and provide them with premium quality Connecting Rod/Piston Rod. We manufacture these connecting and piston rods using quality-approved material, which is sourced from trusted vendors of the market.